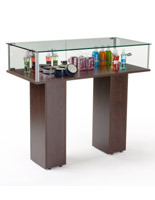 What makes pedestals & tables different from other display cabinetry? 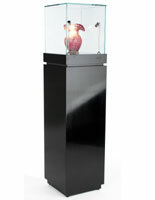 These showcases are engineered to highlight a single item. 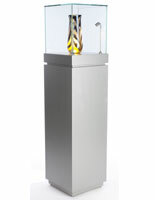 Display pedestals & tables are not just for trophies and awards. They are engineered to complement a large number of exhibits. 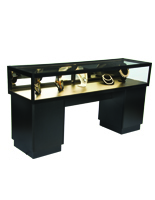 These pedestals & tables are a great option for high-end retail companies that want to promote their products. 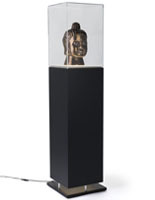 They are ideal showcases for gallery or museum displays of artifacts, as well. Store furniture and retail store risers can be seen virtually anywhere large crowds of people visit. What other locations can use single-item museum-style trophy displays? Elegant pedestals & tables are found in high-end department and specialty stores showcasing top-of-the line objects such as Prada or Gucci handbags, the latest upscale footwear, watches and more. Museum display cases are also seen in airport or other transportation hub concourses to promote area businesses. The business provides a product to place within the locked exhibit area to let air travelers know what's available in the local area. 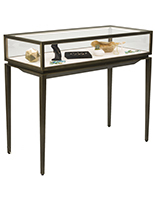 Cultural centers and state parks may use museum style display cases to exhibit artifacts from an archeological dig. Malls may allow stores to place merchandise within one of the exciting exhibit cases to spur retail sales. 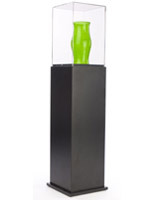 Awards showcases are even found in professional offices showing any number of prized possessions including industry awards and product samples. 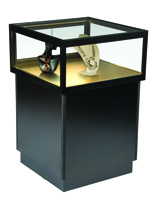 Single-display cabinets for awards and trophies are available in a variety of shapes and sizes. There are narrow bases that allow you to maximize the number of units placed in a single area. There are square stands that are sold in a large number of colors and finishes as well as with and without lights. 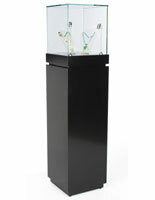 Hexagonal museum display cabinets for awards and trophies are included in our catalog as well. These stands are also available with and without interior track LED lighting. Some are economy models that are crafted of acrylic and others with a modern look that are crafted of tempered glass. 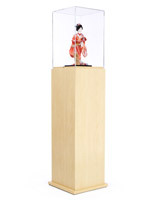 The acrylic case features a clear view of the contents elevated on the pedestal base. Table stands for specialty goods are often seen in retail settings. 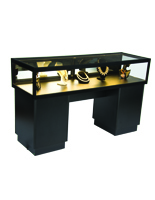 In jewelry stores, pedestal display cases and risers are typically used to showcase lines of rings, bracelets, and earrings. 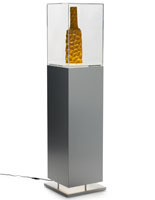 In institutional environments, a single trophy case can highlight one larger item, while other units are designed for drawing smaller merchandise into view. Although many of these are a museum quality curio cabinet, some are not. 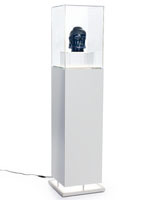 Plastic risers are not generally acceptable for use in art galleries or museums. The models that are acceptable for museum use will state so in the product descriptions. Wooden exhibit cases for trophies, awards and more may be tall or short. They may have a mirrored deck or be plain. They may even feature an acrylic case for more economical presentation options. 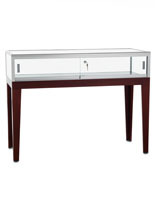 Retail store furniture is engineered for use in museums, retail settings, airports, schools, and many other locations. 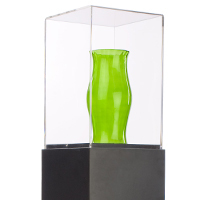 They are affordable trophy holders with tempered glass top that bring an air of elegance to every showroom. 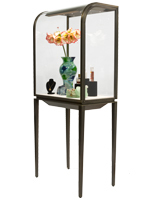 Our display cases and gallery fixtures, available in many sizes and colors are ideal for every environment: retail, school, professional, and home.